"Universities should take a closer look at whether it's worth investing in the trendy model" according to new research from Brigham Young University (BYU). It may be time to tap the brakes a bit on the flipped classroom movement. 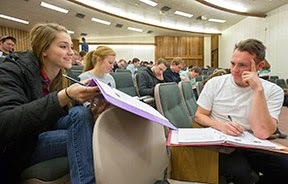 New research out of BYU finds that the flipped classroom model, where lectures happen online outside of class and application activities are done in class, is not necessarily the golden egg people think it is. But, lest flipped advocates get defensive, the study doesn’t suggest throwing out the concept either. When the flipped movement started sweeping the nation a few years ago, Jensen found that all of her pedagogical research hinted it wasn’t quite a slam dunk. Seeing a dearth of research on the matter, her team wanted to know if the flipped classroom was truly making a difference or if there was something else at work. To answer their question, Jensen and her fellow researchers created two identical freshman biology classes, with the only difference being that one section used the flipped model. The two classes had the same instructor, identical lectures, assignments, activities, were taught back-to-back at the same time of day and even used the same jokes so the researchers could control for every possible variation. Most importantly, both used the same level of active learning both in and outside the classroom.